The Eastern State Penitentiary (ESP) is one of Philadelphia’s most historic sights outside of Old City, as well as one of its most popular. The Eastern State is a foreboding edifice that towers over Fairmount Avenue, stretching roughly a block and and half on the front facade. The vines, which slowly sway in the wind, add to this effect, as well as the atmosphere of abandonment. A Gothic tower is centered over the stone doors, with their imposing iron gates. The ESP was an innovative idea in criminal justice, where criminals were confined to solitary confinement for up to 23 hours a day. The conditions of the prison in its earliest days were brutal, but yet was considered much better than most prisons. The cells were small, and had thick walls to prevent interaction with other prisoners. The only light in these cells came from a skylight in the ceiling, although the cells today are kept in a state of “semi-ruin”, much like the rest of the prison. Most of the cells are empty and dusty, with dust and stones littered throughout. There is a self-guided audio tour, which is highly recommended. It’s free, and provides a tour route, and audio for the other sections of the prison. The tour begins in cell block 1, where it describes the life of a prisoner in the Eastern State’s earliest days. 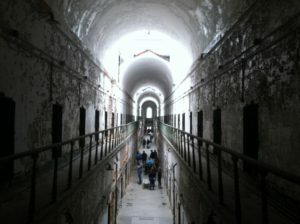 It goes in depth on ESP’s origins, including the reasons for its construction and architecture, as well as the prisons and jails in Philadelphia before the Eastern State. After cell block 1, visitors are brought to the surveillance hub, also known as the “center”, as it is in the center. The radial layout is designed so that guards in the center can take a quick look down all of the blocks. 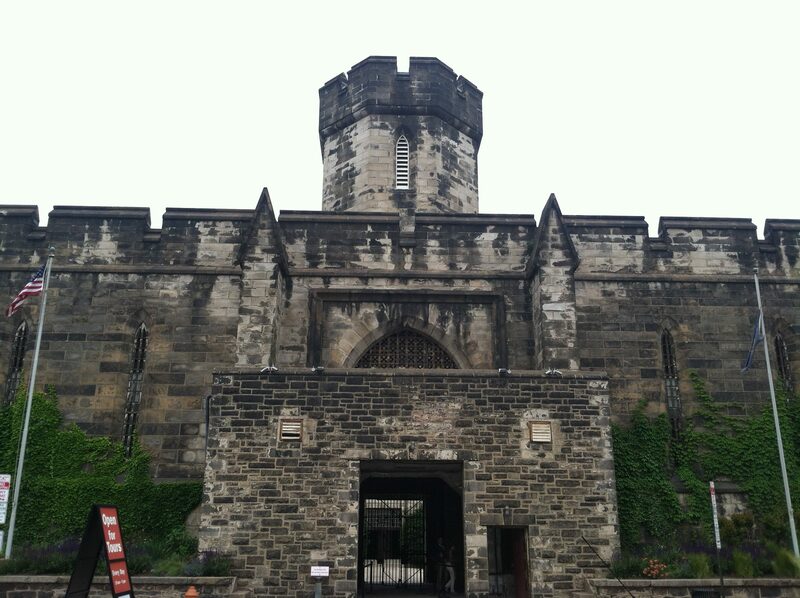 The tour continues on to cell block 7 (pictured below), where it describes the Eastern State’s rise to fame, including a visit from Charles Dickens. The tour moves up cell block 4, where the history of the prison in the 20th century is explained, and how the conditions improved, and how the ESP came to a close in 1971. It concludes in the yard, which is home to the Prisons Today exhibit. The other highlights include Al Capone’s cell, where he stayed during his imprisonment. He had luxury items in his cell, including a $500 radio he would use to listen to waltzes while in prison. He also had ornamental rugs, an oil painting, and furniture within the cell. Capone would listen to waltzes on his radio, which echoes throughout cell block 8. ESP was also home to Willie Sutton, an infamous bank robber from the 1920s, who famously stated that he robbed banks “because that’s where the money is”. In 1945 he escaped via a tunnel at the southwest tip of cell block 7, along with 12 additional convicts. Sutton was recaptured within a few blocks, but his tunnel has been dug up. Nearby is the synagogue, which was the first synagogue in a prison in America, that highlights Jewish life at ESP. ESP is also home to a variety of art installations, which provide commentary on prison life, the stigma around prisons, or prisons in general. They can be found scattered throughout the prison, most of them located in individual cells. One of the most notable is I Always Wanted to go to Paris, France, which contains television sets in three cells with montages of tropes of prison movies, showing the media’s perception of prisons. Another memorable piece has a literal car placed inside one of the ancient cells. The recently-opened Prisons Today exhibit highlights the fact that the United States has the highest incarceration rate in the world, drastically higher than that of runner-up Rwanda. There is a bar graph in the yard that has the incarceration rate per capita in each decade since 1900, highlighting the lowest (1970) and highest (2010) decades. The exhibit concludes that imprisonment for minor crimes does not affect crime rates, as evidenced by the fact that the US violent crime rate has stayed consistent since 1970. Perhaps one of Philly’s best-known seasonal events, Terror Behind the Walls is a Halloween event at ESP that gives a “haunted house” experience. This involves several different events around the prison, all intended to scare you as hard as possible. You must sign a waiver to get in. It is highly recommended that pregnant women and those with medical conditions do not attend. The ESP is open for regular visits during the day during the season, so it won’t prevent regular visits. Also during this time, gargoyles are placed in front of the entrance. If you should go to this event, please don’t do anything stupid. If you do, you’ve ruined a chance at some good fun around Halloween. Admission is $14 for adults, $10 for students and kids, and $12 for seniors. The ESP may be outside the central tourist area, but you should have no qualms about coming here. Fairmount is a very safe neighborhood, and is very close to the Parkway. Being nearly 200 years old, ESP is not entirely accessible for those with disabilities. It kind of goes without saying, but this is among the most disturbing attractions in Philadelphia, so this is definitely not for the faint of heart.